If there is one festival in the thick of winter that people in Delhi look forward to, it is Lohri. It is a time for people to come together in the evening and create an atmosphere of bonfire and bonhomie! Even in a busy city like Delhi, people make an effort to gather wood from all around to make a fire in the evening - sometimes in their lawns, parks or even roads. 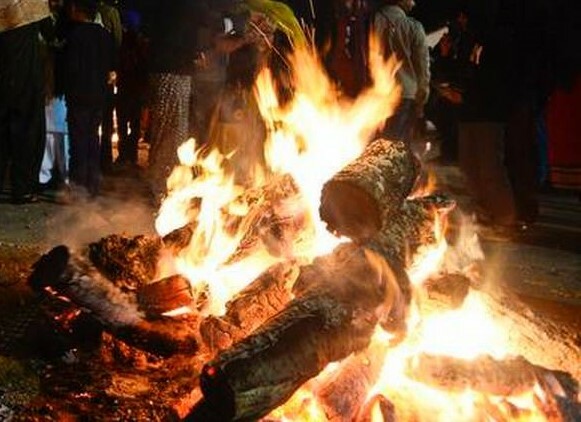 In the evening, people gather around it and enjoy the crackling fire, eating rewris, peanuts and chikkis. Some sing songs and dance around the bonfire creating an atmosphere of mirth and celebration. Why do people celebrate Lohri? Good question. Not many might be able to answer. There are cultural and seasonal twists to the origins of this warm festival. One of the stories behind this festival is that this festival is celebrated in remembrance of Dulla Bhatti, the Indian version of Robin Hood who saved a girl and adopted her as his daughter. Children in some parts of North India sing his songs on this day. But why celebrate Dulla Bhatti on Lohri is a question that doesn't quite have an authentic answer till now. "Why not" could be a very well put riposte to the question "Why?" However, in Punjab where this festival is celebrated in its full glory and excitement, it is said to be a harvest festival. People take a breather from their farming as the rabi crop has been harvested and spend time to sit together and enjoy. Brightly attired young men, women and children dance to the drum beats, the famous Bhangra dance of Punjab!